Grey, slightly iridescent feathers on the neck that shine pink and green in the sunlight. Other colours include white, brownish-red, and mixtures. They can produce up to 9 broods per year but 2 – 3 on average. 2 eggs in each clutch new ones can be laid when their young are just 20 days old. Eggs have a 17 – 19 day incubation period. Their lifespan is around 3-5 years in the wild but up to 35 years in captivity. Nests are built by the female using material collected by the male. They roost together in buildings, ledges, lofts, walls or even statues in towns and cities. 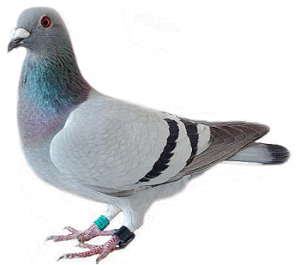 Pigeons feed on seeds, bread, vegetables, meat and other food discarded by humans. Pigeons are able to dip their bills into the water and drink continuously without having to tilt their heads back. Young pigeons are known as squabs. They are fed from a special substance produced in the pigeon’s crop known as pigeon milk. When disturbed, a pigeon in a group will take off with a noisy clapping sound. This informs other pigeons that there is danger present. They are capable of rapid dives and changes in direction and most of the time will easily out manoeuvre a bird of prey, as they can reach speeds of up to 50mph. They are resident and do not migrate. Do not feed pigeons around your building. This could lead to them nesting nearby. Their acidic droppings can erode most surfaces, causing structural degradation to your building. The best known disease passed from birds to man is Psittacosis. Fouling can be a public health hazard and must be cleaned regularly.